It was a tough one. Tougher than we thought it would be. Come on, when Hyundai launches a new small car, you expect it to walk away with the honours, right? More so, since the Business Standard Motoring car of the year jury tends to have a preference for cars that are cheap to buy and run. But a strong contender was a giant killer lurking in the background and it answered to the name of Fusion. Ford Fusion. Sure, the headline and the big picture have given the game away and you do know that the Hyundai Getz has won the coveted award. But know what, we -- the people who undertook the car of the year exercise -- feel cheated. The reason? The new age Ford gave the Hyundai such a fright that the boxy Getz had to rely heavily on its sticker tag and fuel efficiency to win the award. Mind you, only 30 per cent of the car of the year points (a total of 500 spread over 21 parameters) are subjective, and the Fusion won our hearts to score better than the Getz. The butch Ford also won handsomely in the performance category. So there: this time round, the car of the year is not the one that tugs at our heartstrings. But then we have our benchmarks to follow and our methodology gives additional weightage to the two most important factors that dominate the purchase of a car in India. Allow us to take you through the process. In true Business Standard Motoring car of the year tradition, we eliminated the versions, variants, makeovers and such to arrive at the final contenders -- four brand new cars launched in the calendar year 2004. Those eliminated include the revamped Maruti Suzuki Zen and the Esteem, the Tata Indigo Marina, which is essentially the estate version of the Indigo sedan, and the 1.6 version of the Chevrolet Optra. No, we didn't even consider all those special/anniversary/please-buy-me-at-a-discount versions in the market. So, it was a straight match between the Chevrolet Tavera, the Hyundai Elantra (petrol and diesel), the Ford Fusion and the Hyundai Getz. It was very obvious that the Chevrolet, being the newest utility vehicle in the block, will suffer in the performance ratings (c'mon, it has a diesel motor) and the subjective ratings (admit it, it is a tad too old). The Elantra, though it sported last generation architecture, had a performance edge thanks to a peppy petrol motor and lots of luxury that would pamper the jury -- still, it was an expensive car and we somewhat knew its fate was sealed at the sticker level itself. In short, the jury was sharpening its scalpels with one eye firmly focused on the Getz-Fusion twosome. Read on. A 300-km loop chosen for our final evaluation drive -- a bit of metro traffic, a nice stretch of national highway, good B-roads, bad B-roads and a scenic stretch (we didn't want to take in a lot of stress you see) -- made for a good day of hard driving. No, we didn't sample the fantastic local cuisine, we didn't enjoy the beach, nor did we have any fun. The Earth is round, the sun rises in the east and the Hyundai Getz is the Business Standard Motoring Car Of The Year 2005. It had the makings of a winner all through, so our eyebrows were not raised when it did win. This is the second time Hyundai has taken the top honours, the Santro having won the Car Of The Year when it was first launched in the country. As with the Santro, Hyundai again managed to be the first to introduce a model in an all-new category -- that of the mature hatchback -- that holds great growth potential in the country. The Getz looks contemporary and Euro-chic (despite the delay in getting launched in India), offers a decent amount of interior space through clever packaging, has an adequately powerful and smooth engine, more than decent fuel efficiency supporting its cause, offers agreeable ride quality (not so good on bad roads), neutral handling, and a comparatively good price tag. Most of the jury found the Getz pretty neat to look at but a few did find it a tad utilitarian. Despite white-good efficiency and built-in safety, the jury found the car not so appealing to the enthusiast. A CRDi variant or more powerful gasoline motor options in the future will erase this weakness. Still, ladies and gentlemen, this does not take away from the fact that the Getz is a cleverly engineered, well-built, brilliant car. Well done Hyundai Motor India, the Getz deserves the Car Of The Year award. Congratulations, it's time to celebrate! As we said earlier, we would have loved the Fusion to be our Car Of The Year. It looked spiffy enough, had brilliant performance from the 100 bhp engine, scored handsomely throughout the subjective round and then, alas, lost out on fuel consumption and price. We did a bit of a survey at the end of our evaluation and almost everyone said he or she would buy it if they had the means -- those who disagreed wanted Ferraris. The car was deemed well-built but lacking in interior finesse. Almost everyone fell in love with the way the engine developed power and how all that power was transmitted to the wheels (14 points out of 15 for powertrain). The typically European ride quality was well appreciated too, and the Fusion did go around corners at three digit speeds without a hitch. More than anything else, the new Ford scored the best amongst the foursome when it came to the FTD (Fun to Drive) category. If you are in the market for a state-of-the-art car that stands out in the crowd and impresses the driver within you, buy the Fusion. And Ford, trust us when we tell you your car would have won but for the ever-so-slight glitch in the fuel consumption area, and the nasty price tag you have attached to it. It does look like a good case of the number two being a better overall car. What an underdog! The silver Elantra petrol we had summoned for the evaluation skimmed through the twisty bit of asphalt that led us to Murud village near Alibaug. It was fast without being uncontrollable and subtle without being unnoticeable. The nose job was found to be too loud by the jury that also said the rest of the design was a generation old and too Plain Jane. 'Character' is one word that came up a lot during the discussion too -- some said it had none, while others said it tried too hard to have one. Thanks to that 1.8 petrol motor which stood in for the more relaxed yet peppy CRDi engine, the Elantra scored the highest points in the performance parameters, but in the subjective parameters it just about managed to edge out the Tavera. It outscored every car in the features department, earning 77 out of 100 points, and equalled the fuel consumption score of the Tavera too. What let the car down eventually is the fact that it cost close to Rs 10 lakh (yup, we even factored in the dealer discounts which augments its cause; still). If the performance and luxury on offer could win the Car Of The Year, then the Elantra would have been a clear champion. But in that case it could have been the Maybach too! The big Chevy tried to impress us. Actually it tried very hard. To begin with, it looked better than everything else in its class. But a few jury members pointed out that it has a dated design that would become obsolete the moment the competition unleashes one of the New Gen 'neither minivan, nor jeep' concepts. One jury member thought it already looked like it has been around for some time though it is yet to celebrate its first birthday in India. But the jury did award more points to its functional aspects of design and perhaps got a bit carried away by awarding it 11 points against the lowly nine scored by the Hyundai Elantra. Build quality was found questionable by the jury too -- maybe they had a clapped out test-car for evaluation. The diesel motor is adequately powerful and gets the job done, but it was fighting it out with three petrol cars and lost out badly on performance parameters. It topped the charts with a 19.64 score out of 25 for fuel efficiency but was let down by the price tag. A sum total of 322.76 points earned it only fourth place. But we do admit that if it had to battle with cars in its league, the Tavera would have won handsomely. The eligible candidates were rated on 21 automotive-testing parameters classified across five categories; Performance, Subjective, Features, Fuel Efficiency and Price. Each parameter was weighted as per its importance and a total of 500 points was divided into these five categories, based on their relative utility. Accordingly, four Performance parameters were weighted at 25 points each - 100 points total. Ten Subjective utilities were allotted 15 points each - 150 points total, and five individual passenger comfort-related Features took 20 points each - 100 points. Since Fuel Efficiency and Price are the most important factors governing automotive purchase in our country, they receive heavy weightages at 25 and 125 points respectively. The actual performance of each car tested was compared to a benchmark. The closer a car was to the benchmark, the more points it got. 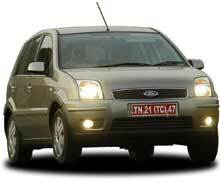 The standard for fuel efficiency was set at 14 kpl, and the price mark was Rs 4 lakh ex-showroom Mumbai. Business Standard Motoring's exclusive formula awarded maximum points for the price closest to the benchmark. Test data and objective observation (Performance, Fuel Efficiency and Features) were accorded more importance - which is why they constitute 45 per cent of the total points, while Subjective parameters accounted for 30 per cent. The price took the leftover 25 per cent of the total score. Points allotted to each contender based on this scheme decided the Business Standard Motoring Car Of The Year 2005.